‘Of the innumerable men whom I have heard lecture from the rostrum, I call three men the greatest: Petavius, Vossius and Varlaeus. However, Vossius stood above them as the cypress trees stand above the tedious undergrowth.’1 Thus wrote the French physician Samuel Sorbière of the polymath Gerardus Joannes Vossius (and presumably with a nod to Virgil when speaking of Rome).2 Vossius, whose catalogue is launched in EMLO this week, is a towering figure in any number of significant ways, not least with respect to his correspondence. Since the earliest days of Cultures of Knowledge, Vossius has been central to the project’s work. EMLO’s database was constructed around the Bodleian card catalogue records, which include the letter collections amassed in the first half of the eighteenth-century by the antiquarian Richard Rawlinson. Vossius’s letters to be found in Rawlinson’s collection comprise the Dutch scholar’s own letter books and contain, therefore, the holograph letters he received, together with copies of his outgoing correspondence. These copies were made either by Vossius himself, or by his sons, or by the students who lodged at the Vos family home, a house in which it was not just the males who were given care and attention. Vossius’s much-loved daughter, Cornelia, who drowned tragically in 1638 following an accident on the ice that involved the sledge in which she was travelling from Amsterdam to Leiden, is known to have been extremely well educated and versed in an impressive number of languages. 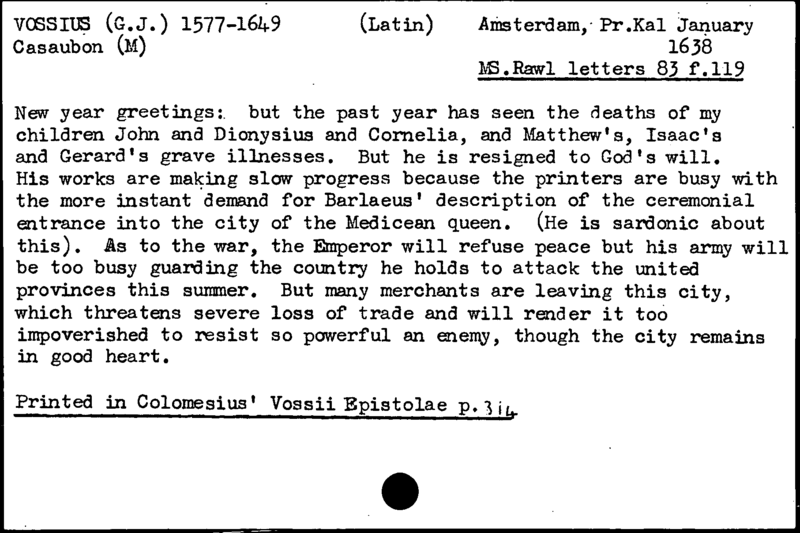 Vossius comes across loud and clear in his correspondence not only as a significant scholar but also as an exceptionally kind and caring individual and family man. When starting working with Bodleian card catalogue records six years ago, it struck me how often and how deeply this man mourned the deaths of those he loved — members of his family and his children, his friends — as well as how he sympathized with and sent comfort to a wide range of correspondents as they struggled to endure similar sorrow and bereavement. 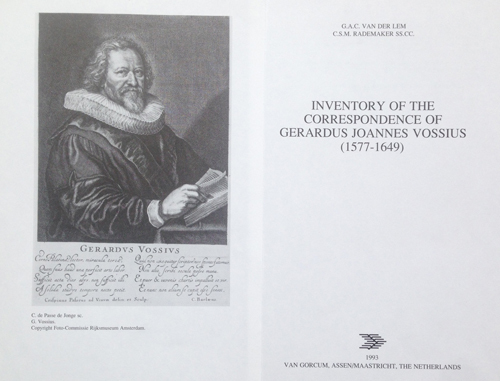 G. A. C. van der Lem and C. S. M. Rademaker, ‘Inventory of the Correspondence of Gerardus Joannes Vossius (1577–1649)’ (Assen and Maastricht: Van Gorcum, 1993). Work is ongoing in EMLO to link the dual interpretations for each letter. Thanks to the generous gift of the meticulously ordered working notes and facsimiles (pictured below in their boxes on the shelves in my office) used by Anton van der Lem and Cor Rademaker as they worked on Vossius’s vast correspondence, we are able to tidy up simultaneously many of the mistakes contained within the Bodleian card catalogue’s person records. The inventory these two scholars brought out in print in 1993 serves as an invaluable finding-aid for the complete correspondence, and should anyone be interested in pursuing work with the texts of Vossius’s letters, please be in touch with us at EMLO as the underlying metadata could provide a firm base upon which future work might be layered. Equally, should scholars be interested in working with the networks of which G. J. Vossius formed a part (together with those of his son Isaac, whose calendar of correspondence was published last year in EMLO by the Leiden-based scholar Dr Robin Buning), we would be delighted to help in every way possible. This entry was posted in Uncategorized on June 27, 2017 by Miranda Lewis. To illustrate how we’ve been counting down days, I couldn’t resist putting together a little welcome slide for Professor Antony McKenna who is due to speak on his work as editor of the Correspondance de Pierre Bayle in Oxford’s Faculty of History at 4 p.m. today. It concerns a detail from a letter of 7 July 1696 from Edward Bernard — Oxford’s Savilian Professor of Astronomy — to Thomas Smith, the orientalist, antiquary, and librarian, who was formerly at Magdalen College, Oxford, but who, by 1696, was living in Soho’s Dean Street at a house belonging to his fellow nonjuror Hilkiah Bedford and was working as unofficial librarian for Sir John Cotton (the grandson of Sir Robert Cotton, founder of the Cotton library). 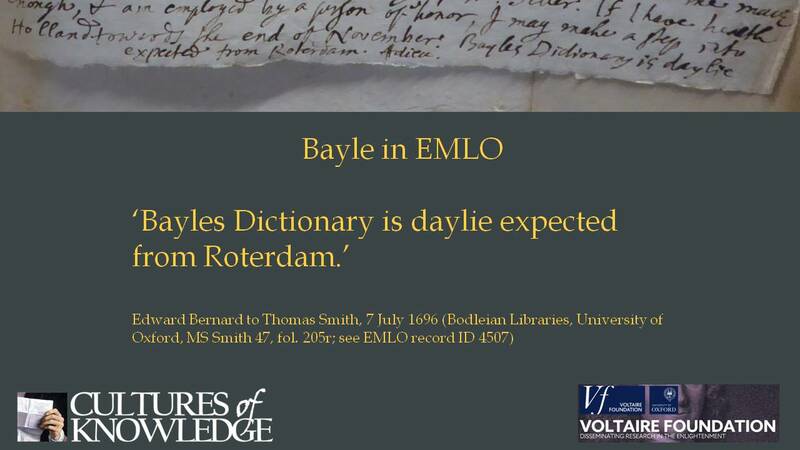 Before signing off, Bernard noted to his friend ‘Bayles Dictionary is daylie expected from Roterdam.’ Sadly Bernard died six months after this letter was dispatched, and although I’ve not had time to find out whether the dictionary made it to Oxford as soon as he expected, we can but hope. And now we’re all looking forward just as eagerly to Professor McKenna’s talk this afternoon. Anyone interested in the scholarly work that is the bedrock of a complete critical edition will be most welcome to join us (for full details please see my previous post). Should you not be be able to make it, Professor McKenna has kindly agreed that the lecture may be recorded and a podcast made available — I’ll keep you informed of the details regarding its release. This entry was posted in Uncategorized on June 19, 2017 by Miranda Lewis. 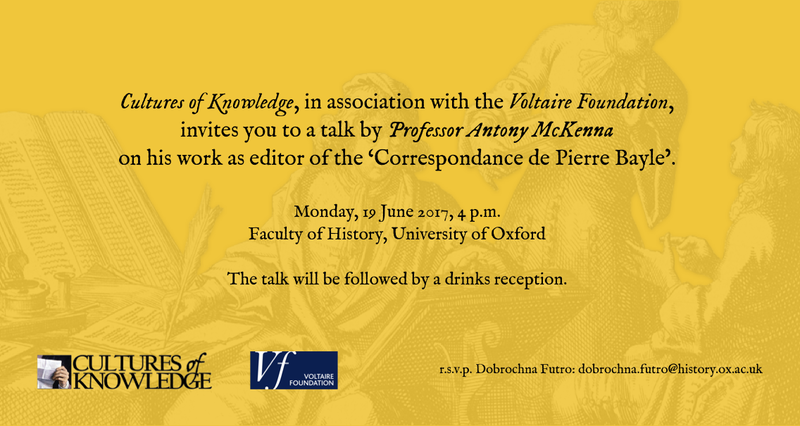 While in Oxford for a few days next week, Professor Antony McKenna has kindly agreed to give a talk about the decades of meticulous scholarship that have culminated this year in completion of the truly magnificent critical edition Correspondance de Pierre Bayle.1 His lecture will provide those interested in the ongoing work at Cultures of Knowledge and Early Modern Letters Online [EMLO] with a unique opportunity to hear about the research and teamwork underlying this edition, which has been published in fifteen glorious volumes by the Voltaire Foundation, Oxford, and partially online at the l’Université Jean Monnet Saint-Étienne, France, as well as in calendar format in EMLO. In addition, over the course of the months ahead, the texts of Bayle’s letters will be incorporated also into the ePistolarium database (Huygens ING) and Oxford’s Electronic Enlightenment. Professor McKenna’s talk — hosted by Cultures of Knowledge and the Voltaire Foundation — will be delivered in the Lecture Theatre in Oxford’s History Faculty and will be followed by a reception. All who are interested and find themselves in and around Oxford on Monday at 4 p.m. are most welcome to attend (although we’d appreciate a quick r.s.v.p. [dobrochna.futro@history.ox.ac.uk] if you plan to join us). Full details may be found in the invitation below. This entry was posted in Uncategorized on June 16, 2017 by Miranda Lewis.